When I moved to Colorado in the summer of 2011, it wasn’t long before I started seeing green chiles. They were being roasted at grocery stores and roadside stands; not to mention that you can find it in restaurants everywhere, whether they serve Mexican food or burgers. So I started asking my Colorado friends what the deal was with the green chile. Little did I know, there is a long-standing battle between Colorado and New Mexico for who has the best green chile. Technically, Hatch green chiles are grown in the Hatch Valley in New Mexico, from August until early September. This is the only time that you can get fresh Hatch chiles. Otherwise, they are roasted and then frozen or canned. Every year in September, the town of Hatch celebrates the chile with a two-day Hatch Valley Chile Festival that includes live music and, of course, chiles. While New Mexico has the Hatch Valley Chile Festival, Colorado has chili cook-offs in cities around the state in August-September, with the big one being the Chile & Frijoles Festival in Pueblo in late September. Governer John Hickenlooper has even designated the last Saturday of the Colorado State Fair as Pueblo Chile Day. Every time Denver’s Westword magazine posts something about Colorado’s green chile, it sparks a debate. “Any time we mention green chile, it gets a lot of reaction,” says Mark Antonation, Food and Drink editor for Westword. In 2015, their annual list of the best green chile in Denver brought out some strong feelings, as evidenced in these Facebook comments. Each state believes that their unique growing conditions yield the better tasting pepper, but this is a debate that may never be laid to rest, since flavors depend so much on personal preference. 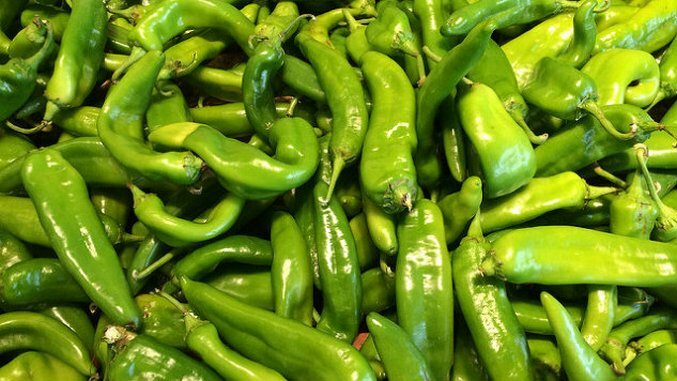 While Hatch green chiles are known for their smoky, rich flavor, Pueblo chiles are known for being a little hotter than cayenne peppers (unless you get a little one, which is much hotter). New Mexicans say that while the Pueblo chile has changed Colorado economically, in their state, the Hatch chile is a way of life. The influence of the Hatch chile has spread so far that New York’s Brooklyn Kitchen is hosting a Hatch chile roast with Zia Green Chile Company on September 25, where they’ll be roasting Hatches and selling two varieties, Big Jim, a medium-heat Hatch, and Sandias, a high-heat variety, for $8 per pound. Freshly-cooked pork green chili will be served to guests. But what does it really come down to? “Green Chile” says relax. Abbie Mood lives just outside Denver, Colorado and can usually be found running around outside, writing, or planning her next adventure. She is a freelance writer and life coach who loves to explore environmental and animal rights issues, food culture, and the human experience through her writing. You can find out more about her at abbiemood.com or at her blog.